Carroll McColpin was born on November 15, 1914, in Buffalo, New York. He learned to fly in 1930, obtained his private pilot's certificate in 1936, and joined the British Royal Air Force in November 1940. McColpin received his pilot wings in the RAF on February 6, 1941, and then served with No.607 Squadron from April to May 1941, and with No.121 Eagle Squadron from May to June 1941. His next assignment was with No.71 Eagle Squadron from June 1941 to January 1942, during which time he was credited with the destruction of 6 enemy aircraft in aerial combat, followed by service with No.133 Eagle Squadron, from January to September 1942. During this time, F/Lt McColpin was credited with destroying 2 more enemy aircraft in aerial combat, plus 2 damaged, before transferring to the U.S. Army Air Forces as a Major on September 25, 1942. His first assignment with the USAAF was as Commander of the 336th Fighter Squadron of the 4th Fighter Group in England from September to November 1942, and then as assistant deputy for operations of 3rd Fighter Command at Drew Field, Florida, from November 1942 to September 1943. Col McColpin next served as Commander of the 407th Fighter Group at Lakeland, Florida, from September 1943 to January 1944, followed by service as Commander of the 404th Fighter Group at Myrtle Beach, South Carolina, and then deployed to England, from January to November 1944. During this time, he destroyed 3 more enemy aircraft in aerial combat, and damaged 1, although the 3 air victories were never officially credited to him. This gave him a total of 11 enemy aircraft destroyed in the air during World War II, and 3 damaged. His next assignment was as director of combat operations for the 29th Tactical Air Command in England from November 1944 to February 1945, and then as Deputy Commander and then Commander of the 3rd Fighter Command Gunnery School at Pinellas, Florida, from March 1945 to February 1946. Col McColpin served as Commander of the 335th Fighter Group at Schweinfurt, Germany, from February 1946 to September 1947, followed by service as Commander of the 31st Fighter Group at Turner AFB, Georgia, from November 1947 to February 1950. He next attended Armed Forces Staff College at Norfolk, Virginia, from February to July 1950, and then served as Chief of the Operations Center for Headquarters Continental Air Command at Mitchel Field, New York, from July 1950 to January 1951. 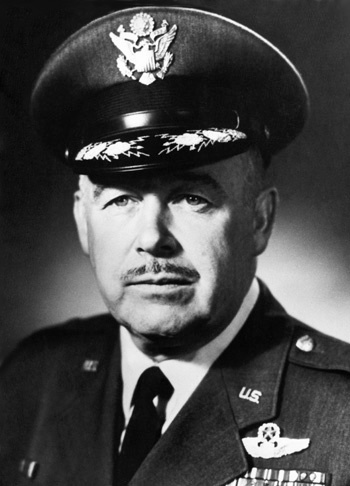 Col McColpin served as Director of Operations and Training for Headquarters Air Defense Command at Ent AFB, Colorado, from January 1951 to May 1952, followed by service as Deputy for Operations with Headquarters Eastern Air Defense Force at Stewart AFB, New York, from June 1952 to July 1954. After completing Air War College at Maxwell AFB, Alabama, he served as Commander of the 64th Air Division at Pepperrell AFB in Newfoundland, Canada, from August 1955 to July 1958, and then as Director of Operations with NORAD at Ent AFB from August 1958 to July 1962. Gen McColpin's next assignment was as Commander of the San Francisco Air Defense Sector at Beale AFB, California, from August 1962 to June 1963, followed by service as Commander of the Portland Air Defense Sector at Adair AFS, Oregon, from July 1963 to October 1964. He served as Vice Commander of 28th Air Division at Hamilton AFB, California, from October 1964 to March 1965, and then as Commander of the 28th Air Division from April 1965 to March 1966. Gen McColpin's final assignment was as Commander of 4th Air Force at Hamilton AFB from April 1966 until his retirement from the Air Force on September 1, 1968. Carroll McColpin died on November 28, 2003, and was buried at Arlington National Cemetery. For heroic and outstanding achievement while participating in aerial flight in the European Theater of Operations on 6 June 1944. Col McColpin distinguished himself by a particularly high degree of leadership, bravery, and flying skill while personally leading his group on three assault cover missions in the vicinity of Caen and Bayeux on D-Day. With enemy ground installations throwing up an intense concentration of anti-aircraft fire, Colonel McColpin bravely led his squadron to attack enemy artillery installations, armored columns, and heavily defended machine gun emplacements in the path of advancing Allied units. The heavy losses in men and material inflicted on the enemy under his able leadership were of single importance to the advance of friendly troops in the sector covered; the brilliant leadership and dauntless courage exhibited by Col McColpin are in keeping with the highest traditions of the service.